This series of posts is a continuing public testing and refining of my hunch that surges in minimum anomalies indicate later upper level disturbances. Since September last year my success rate is 80%. Exactly right. I could have narrowed it down to +/- 2 days. SOI 30 day mean is 3.5. NINO 3.4 Index for August was + 0.73 and rising. The Indian Ocean Dipole is currently +0.48 and falling. We are looking at a weak El Nino, with a positive IOD, so conditions will be generally dry in spring before returning to normal summer conditions. Alternatively, we could be in for an early and heavier Wet, and a return to La Nina next year- I will discuss this possibility in a future post. I’m not so sure about January now: earlier I thought it would be hot and dry but I will have to wait until further into the season. 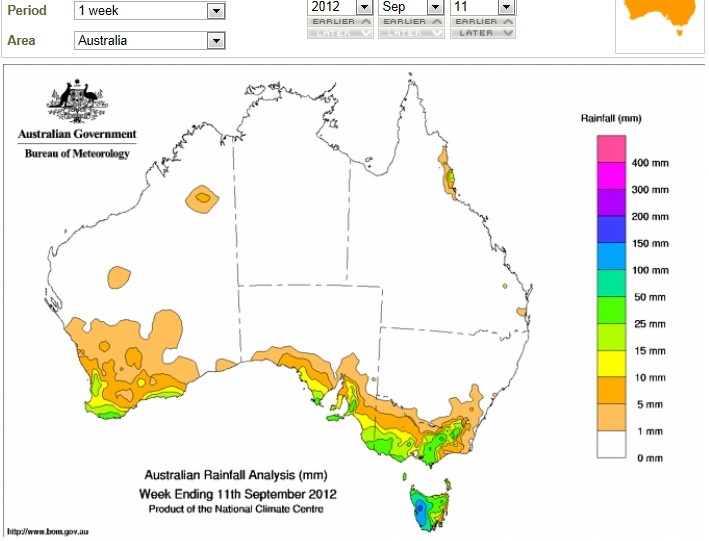 Normal or above wet season rains are likely in early February. October 18 +/- 3 days? Possibly November 26? Enhanced weather activity to begin in this period Possible storms. This may last to early December. 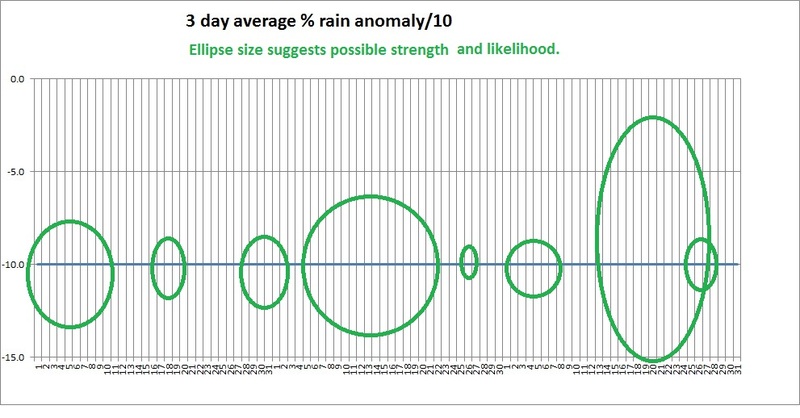 Possible extra influence Possible heavier storms or rain starting in this period, possibly lasting past Xmas. January- possible 13 +/- 3 days? 22 +/- 2 days? 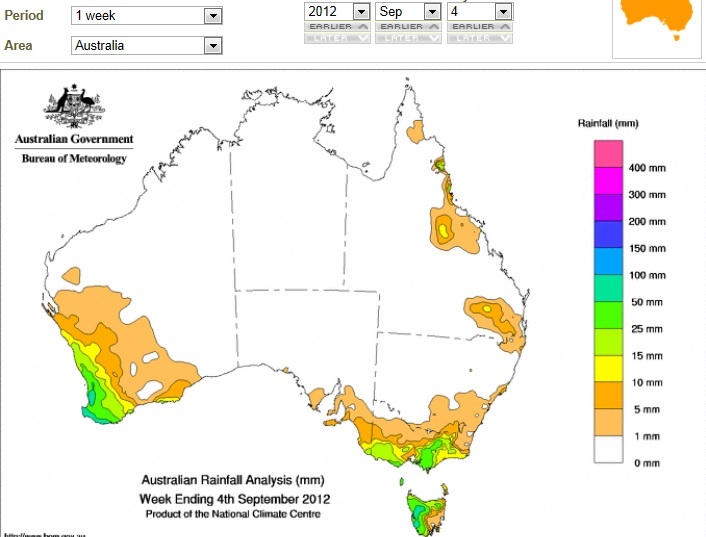 Probable upper system enhancing wet season begins in this period Possible early storms? Here’s a graphical representation of when I expect upper level disturbances for the rest of this year. 30 day mean Minimum percentage anomaly for the 10 Subtropical Queensland sites I monitor as at 20 September (almost the equinox) was -0.39. This entry was posted on September 20, 2012 at 4:56 pm and is filed under Uncategorized. You can follow any responses to this entry through the RSS 2.0 feed. You can leave a response, or trackback from your own site. Should add we had 0.8mm in the gauge this morning and it appears there maybe a bit more on the way. I’m delighted someone has noticed! Obviously you’re somewhere in Central or Sth Qld. We had even less rain up here (south of Sarina) which was a tad disappointing after the promising forecasts on ABC weather, but I’m not surprised as the ENSO is still mild El Nino- possibly recovering- heavier falls later in the season. I note Darwin had a decent fall on the weekend which is a good sign of changing ENSO status. Please remember I’m predicting upper level disturbances, not rainfall necessarily. 8-9-10 August saw an upper disturbance without rain. So I’m getting the timing right, but not the rain amount. – a surge in Tmin anomalies averaged over 10 locations, indicates upper disturbance a considerable time in the future. As well, a rain event frequently has an “echo” 40 days later, I think because that’s the time for a system to travel around the globe at our latitude. Don’t ask me to explain the mechanism- I’ve no idea. But it seems to work. Ken, put me down for SEQld about 12km from the coast as the crow flies and average rainfall (from local official weather stations, one (now closed) about 100m away) since 1893 of 1801mm per year. The ants and the black cockatoos are short term predicators of rain. Maybe they can pick up pressure changes. I would not trust Tmin around here because of UHI. I have an outside temperature gauge in my car, I notice increased temperatures from 1C upto 4C going from rural and semi-rural open or treed areas to urban and shopping areas that have little vegetation. I do not know how temperatures can be measured reliably. 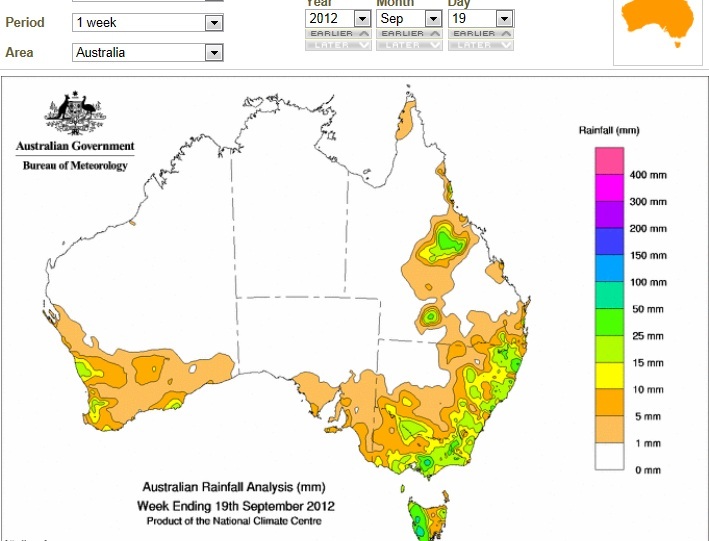 By the way August 2012 at 1.1mm (in my gauge) was the second driest on record after 1991 (0.8mm). 1991 had negative SOI right through including Aug. and it seems there there was an El Nino through to 1992. That seems strange. I wouldn’t trust Tmin anywhere. However, it is an indication of the local minimum amount of energy in the system, and responds to fluctuations in humidity and cloudiness. I use LongPaddock and Bob Tisdale’s blog a lot. SOI is positive, NINO 3.4 is falling, and I would not be surprised if we return to normal or wetter conditions next year. This is definitely an odd year. Thanks for looking at my predictions. Don’t forget to spread the word if success continues! But ah, now I see in the fine print below, the overall temp anomalies are based on the 1961-1990 mean averages, not the actual mean averages for all the stations. So despite the actual mean min temps are below average for Sep, by comparing temps with a preselected time period, we can get an above average temp. Way to go!